2018 POPSUGAR Reading Challenge prompt: A book with alliteration in the title. 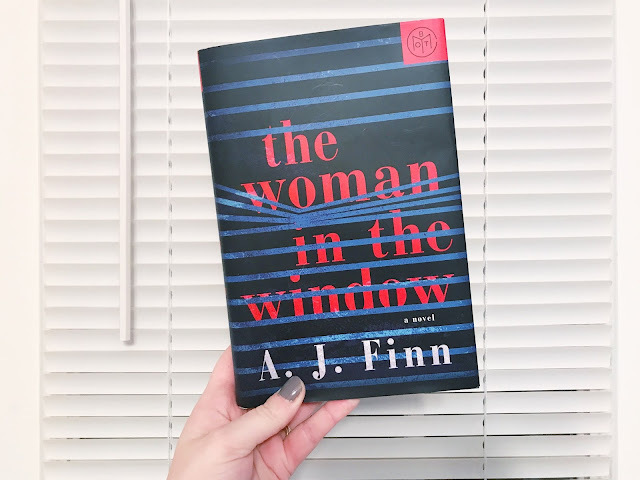 Over the past few weeks, I've heard nothing by crazy amazing things about The Woman in the Window, so obviously I immediately picked it when I saw it was a choice for my January Book of the Month pick. Seriously though, this book is the book of 2018 so far. In fact, it's already being developed for a film, and I can totally see why. I will say, though, I was a little surprised to find out the author is actually not a woman. I've gotten so used the the "woman/girl" domestic thrillers being written by women, so I was truly surprised (after finishing the book) to find out A.J. Finn is a male. Speaking of surprises, I was really surprised throughout this book. There were a few things that I was able to call out before they happened, but regardless, there were a lot of twisty turns that kept me guessing. While Anna isn't necessarily easy to relate to, she is definitely interesting. There are a couple of stories happening at the same time, but they're both really intriguing and they tie in together. While I kind of saw it coming (which attributes to the 4 stars instead of 5), the twist at the end was pretty shocking. I'd say though, overall, The Woman in the Window was seriously impossible to put down. I'd definitely recommend it. Truthfully, this book is kind of hard to talk about without giving too much away, but I would love to chat about thoughts if anyone else has read it.